For the first time, a team led by Prof. Jian-Wei Pan and Prof. Bo Zhao at the University of Science and Technology of China, have successfully observed scattering resonances between atoms and molecules at ultra-low temperatures, shedding light on the quantum nature of atom-molecule interactions that have so far only been discussed in theory. These observations greatly aid in the advancement of ultra-cold polar molecules and ultra-cold chemical physics. The new insights inform several other disciplines, such as designing high precision clocks, powerful microscopes, biological compasses and super-powerful quantum computers. The field of chemical physics, a subcategory of quantum chemistry, has long been focusing on understanding the interactions of atoms and molecules at their very basic levels. Specifically, the aim has been to elucidate the scattering resonances, a remarkable quantum phenomenon that is expected to be a routine rather than an exception at temperatures near absolute zero. Specific to this research, the focus has been an understanding of scattering resonances of heavy molecules at ultra-cold temperatures, conditions under which particles move so slowly that one has enough time to both investigate and control their structure and motion with either electric or magnetic fields. The first-of-its-kind study is published in the journal Science this week. It describes a specific type of interaction between atoms and molecules, namely potassium-40 (40K) atoms and sodium-23-potassium-40 (23Na40K) molecules. This interaction was taking place at ultra-low temperatures and was manipulated by a magnetic field. The authors were thereby able to observe the specific scattering resonances, between the aforementioned atoms and molecules, which was so far only theorized. 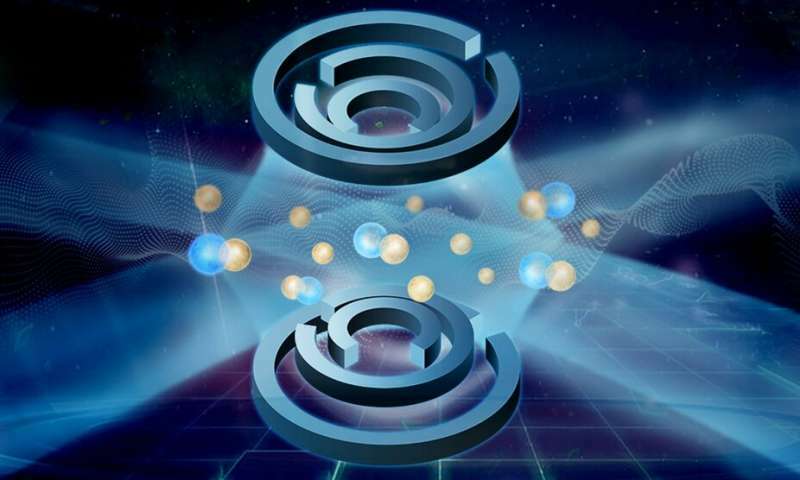 "The molecules are heavy, and the structure of their energy field is very complex, which may result in a large amount of atom-molecule resonances," according to Bo Zhao. "Theory cannot predict the positions of these atom-molecule resonances. In fact, it is unclear whether the atom-molecule resonances at ultra-cold temperatures are resolvable and observable prior to our work," he adds. In their future endeavors, the team aims to explore even more parameters in order to understand them. "The next step is to measure more resonances and try to understand them. Our hope is to collaborate with theoreticians and find an accurate and predictive model that can understand and predict the atom-molecule scattering at ultra-low temperatures. This is the ultimate gold of studying ultra-cold collisions involving molecules," according to Zhao.